We are all immersed in bubbles. They are physical and conceptual boundaries, either constructed by us or by the ideas that we unconsciously absorb from the world. In this blog you are going to venture into your daily bubbles and perceive how they change along with a greater sphere that surrounds all others: the climate bubble. Phase 1 ends... in 2017 the posts will come to life! By this moment we all have explored different situations in which climate change is impacting in our daily lives. And if you looked closer, then you have also found some solutions, not only in the posts but deep in your mind too. Writing this blog made me realize how far we are for understanding and feeling the climate change in ourselves. How far we are of perceiving the climate bubble that surround us. So the next step for me is leave the keyboard for a while and go out there and share with some random persons the knowledge that we have discovered through the past months. Maybe you will find me in the streets wearing a t-shirt made by recycled pet and making people think about the carbon footprint of their clothes. Maybe I will try to involve some local cafes into climate change mitigation and adaptation projects. Or maybe I will play some climatic sounds in a public square of London. Whatever you do, remember that you can be a game-changer in your work, in your neighborhood, in your family and everywhere. This is a goodbye for now. Next time we meet, let's do it in a better world! Is climate change driving fashion? Or fashion is driving climate change? The annual carbon emissions derived from a household's new clothing is equivalent to driving and average modern car for 6000 miles! We have talked about different ways in which climate change affect our daily activities and ourselves. But maybe one of the most tangible ways to feel that climate change surround us is through the things that cover our bodies every day: The clothes. The clothing/fashion industry and climate change have synergic shifts and are very closely related. There are several studies on the greenhouse emissions of the clothing industry and a lot of news articles about how climate change have driven major strategies in cloth designing. As I see it, it’s a positive feedback loop that could run in both directions depending on the consumer’s decision. The feedback in the inconvenient direction is as follows: a) consumers decide to buy cheap massively produced clothes. 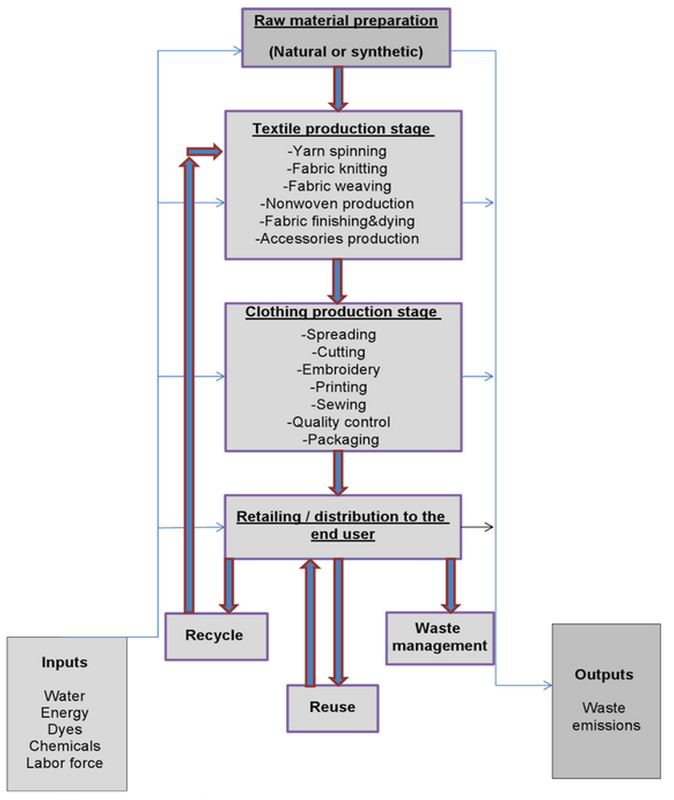 Then, b) the emissions derived by the consumers’ decisions could amplify climate change – the clothing industry is considered the second largest polluter in the world - , resulting in c) more frequent and intense extreme events, which could increase the demand of a) cheap clothes that satisfy the new necessities presented by the new climate patterns of the region. On the opposite direction we have that if consumers decide to buy low-carbon clothes, then a major source of greenhouse gases would be mitigated ,making the (not-very-cheap) low-carbon clothes a profitable decision for consumers since climate won’t change drastically in their regions and the fashion industry would invest in green campaigns making more consumers to buy low-carbon clothes. 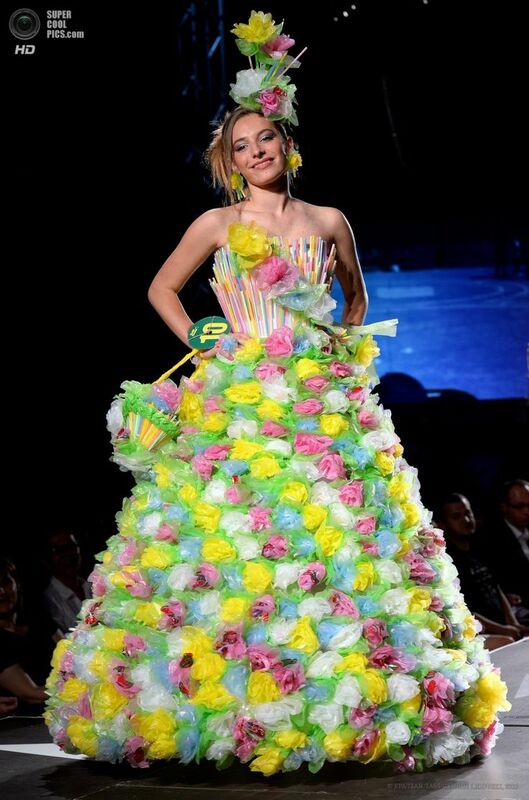 Dress made of plastic bags and straws - trash fashion show. CLIMATE AFFECTING FASHION: You would find surprising that the Fashion Institute of Technology in New York – whose alumni include Calvin Klein – just launched a course focused on forecasting the climate seasonal trends in order to plan the clothes’ designs and increase sales. If we are expecting warmer winters under climate change scenarios, then it has no point to fill the shelves with thick coats that will end in the discounts area at the end of the season. This is a reflection of how climate change plays an important role in the fashion industry. FASHION AFFECTING CLIMATE: The fashion industry involves several processes at different stages that we should take into account when we want to know how fashion affects the environment and specifically the climate. The best way to approach this question is through a life cycle assessment, which analyzes all the sub-products of the industry – including emissions – through all the stages, from the raw materials production to the disposing. A study shows that the clothing industry in China – a major clothes’ producer – generates 80% of their carbon emissions due to an inefficient usage of coal during key processes. Clothing life cycle. 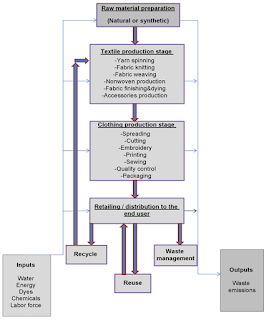 Source: Handbook of Life Cycle Assessment of textiles and clothing. FASHION MITIGATING CLIMATE CHANGE: In the clothing industry have emerged the low-carbon slogan, a way in which designers create environmental-friendly clothes. A study describes that whenever big fashion brands get involved into this movements they encourage consumers to be part of the trend and eventually the consumers absorb the idea and start to purchase clothes rationally. A great example of this low-carbon projects is “Eco Circle” a partnership between more than 150 clothing companies which collects used polyester clothes and put them into a chemical process that generates “virgin” polyester fibers ready to use for making brand new clothes. CONSUMER MITIGATING CLIMATE CHANGE: YES, YOU! As a clothes’ consumer you can do a lot to mitigate climate change. You can start by buying fewer clothes and start renovating your wardrobe in more creative ways (internet is full of this!). You can also start buying low-carbon clothes (here is a list of the brands). Whenever is possible and the sun is shining try to dry your clothes naturally, you will save some energy there! Finally, whenever you decide to say goodbye to certain clothes, you can donate them instead of dispose them in the garbage. So next time you wear clothes, remember that you can be part of the solution to the climate change! Merry Christsmas... while it lasts! "No Planet, No Christmas" is the seasonal slogan for SodaStream, the new machine that adds bubbles into the water in order to avoid buying bottles and reducing plastic waste. Climate change surround our daily lives also in the form of ads and sales strategies of tons of products. So in this sense that are good news at least. A lot of industry and specific brands are starting to care about the planet and they have realized that it is also a good strategy to increase sales. So in this Christmas season remember to buy rationally and buy low-carbon products. Here you have a great SodaStream ad, specially for the "Game of Thrones" fans. 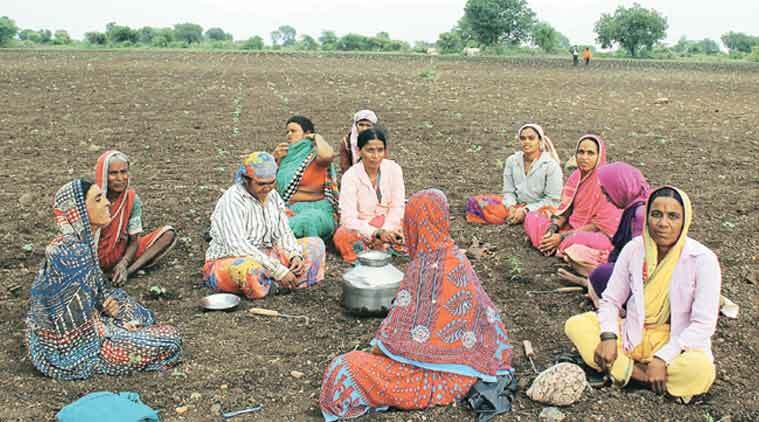 Of culture, sports and climate change. Or a story of your inner bubble. When I came to study my masters in London, I was sure that great and unexpected things were waiting. For sure one of them is my recent integration into my University’s Ice Hockey team: The Yetis! I, as a Mexican, have never experienced too much winter sports, since Mexico (in specific Mexico City) is a quite template region all year long. However, this is not the case for the rest of the team. In a recent talk with the Ice Club President, Keir Ovington, told me how his father used to play hockey when he was a kid in an outdoor pond in Canada, which nowadays barely freezes. Moreover, David Persson, a new member of the Yetis, told me about his childhood in Sweden and how every winter he used to play hockey in a lake near his house with anyone who was there. This conversations made me think how ice hockey could lay very deep into some cultures and communities cohesion and how climate change could threaten things like this. Canada is the place where frozen lakes gave place to ice hockey and it’s also there where winters are becoming warmer every year. 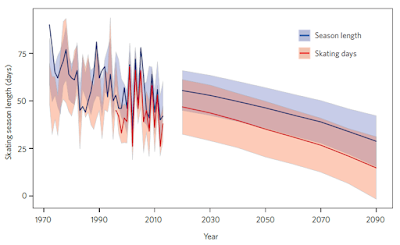 The mean temperature has already rose 1.5ºC in the period 1950-2010 due to the well-known arctic amplification effect that exaggerates the mean global temperature changes in north regions of the world. 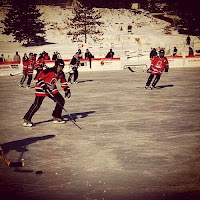 Although ice hockey is now officially played indoors in climate-controlled facilities, most social scientist agree that outdoor practice is part of the imaginary and nationhood of whole Canada, and some say that if hockey was a religion then outdoors rinks would be the churches. A study in 2015 that quantified and modeled the number of ice-skating days in Rideau Canal, the world’s largest outdoor ice-skating surface, found that since 1970 the skating season is reducing by 5 days per decade (see Figure 1). And in a business-as-usual scenario, the trend would imply only 14 days for ice-skating by the year 2090. Figure 1. Historical and projected season length and skating days at the Rideau Canal Skateway. Season length: opening to closure. Skating days: season days minus closure days. Source: Brammer et al., 2015. The study mentioned above also found that the trends were mainly function of the mean temperature of the 100 coldest days of the year. Which I use here to ‘extrapolate’ the study – just as an illustrative exercise - to a worldwide dimension, taking into account some data analysis presented in the last IPCC report. As shown in the Figure 2, the number of cold days is decreasing dramatically almost everywhere, which implies that the mean temperature of the 100 coldest days of each year is increasing. Therefore, we can infer that almost all the lakes in the world are suffering from the same shortening of frozen season. Figure 2. Trends in annual frequency of extreme temperatures over the period 1951–2010. Black plus signs indicate places where the trend is significant. Source: IPCC Fifth Assessment Report, Working Group I. So maybe you think, what does it matter if we won’t be able to play outdoors anymore? I mean, there are worst things like health-related problems or extreme events that will intensify with climate change. The thing here is that climate change is taking away from us everything that we consider valuable as humankind, from material to spiritual and cultural assets. And in order to face this challenge we need to be complete as persons and we need to stay strong and together. And it is hope and our culture and our traditions a very important part of what make us stand strong. So ask yourself, do you love the unique feeling of hiking a mountain? The adrenaline of surfing a wave? The passion of a soccer match down your neighborhood’s park? If you appreciate any of these, rise up and act now, don’t let climate change take this away from you. As long as one of us believes, anything is possible. 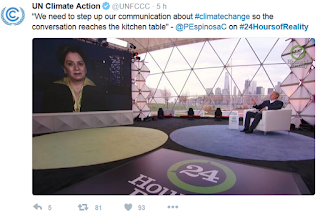 Yesterday, a world-wide climate change communication event took place: 24 hours of reality. A live broadcast that explored hour-by-hour each of the 24 largest CO2-emitting countries and their opportunity areas to make a change towards a low-carbon development. This was part of the Climate Reality Project, an organization founded by the former U.S.A. vice-president Al Gore. The main point was to raise awareness about climate change and realize that our individual actions will decide the humankind's future. Here is a heart-touching poem presented in 24 hours of reality that will definitely motivate you to keep facing climate change! You never know what you have until it’s gone, especially when we are talking about health. As seen before, climate change could damage our lives in many ways, but the most personal and tragic one is definitely the bubble of our wellbeing. There are many ways in which this can happen. Climate change takes different routes to damage persons. It could take a rapid way and kill somebody in a couple of hours, or it can build up certain conditions in our body for several years until we can’t stand it anymore and eventually die. Primary risk: this are the direct consequences of changing the atmospheric conditions that could result in more intense or frequent heat waves, tropical storms, temperature-enhanced levels of air pollutants and so on. Therefore persons would be at risk just by the atmospheric conditions that surround them and their implications to their physiology. 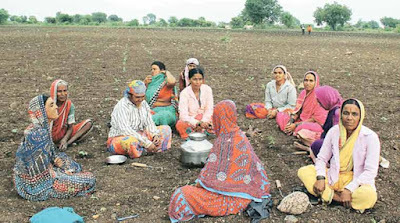 For example, the UK Foreign and Commonwealth Office sponsored a study in 2016 that showed how atmospheric conditions that correspond with the worst case scenario would be physiologically intolerable for outdoors workers during the hottest month in northern India, making impossible the agricultural activities. Which take us to the next risk stage. This a 'Graphical Abstract' of one study (Xinrui et al., 2016) that shows the relation between mortality in Hefei (a city in China) and temperature-enhanced levels of air pollution. It concludes that illiterate people and female are the most affected. Secondary Risk: this stage of health’s risk is driven by all the changes in the ecological systems that surround us. We have shaped our lives, cities, food yields, habits and even medicines having in mind certain environmental conditions and assuming they will remain stable, but whenever they change so rapidly everything start to fail and eventually the failures reach our health. The two major risk arise from food yields and water supplies failure. But also the change in disease patterns play a very important role. For example, in China is projected that schistosomiasis (a disease caused by parasitic worms) will affect another 20 million people by 2050 under a medium climate change scenario that causes an extension of the transmission zone in the country. 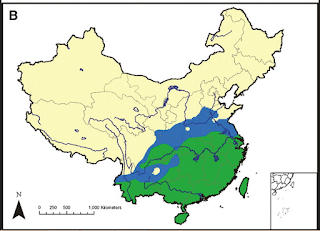 Predicted risk map of schistosomiasis transmission in China in 2050 (green color denotes potential risk areas for schistosomiasis transmission in 2000, and blue color denotes predicted additional risk areas). Source: Zhou et al., 2008 - quite old but really illustrative -. Tertiary Risk: This can be seen as more diffuse effects caused by the situations presented above. A failing farming community or a displaced group could easily suffer mental health problems and tension that lead to health risk. Clean modes of transportation would reduce the local air pollution and the global greenhouse gases (GHG). Improving public transport and making pedestrian and cycling-friendly roads would tackle the sedentary living habits as well as reducing GHGs. Improvements in reproductive literacy would lead to fewer and better-spaced pregnancies which would be healthier and reduce pressure in ecological and climate systems. Innovative urban design would increase the energy efficiency and reduce the effects of heat islands as well as promote community cohesion. We may talk more in detail about health and climate change in the future. But for now we have superficially covered the whole spectrum that this complex topic entails. Meanwhile take care of yourself in this cold season, and go for a hot chocolate or a mulled wine! Read you later.